In an attempt to get more healthy and lead healthier lives more and more people are taking up bike riding. With so many options when it comes to where people can ride depending on the area that they live in. These days a person can find a bike that fits in with any type of riding they want to do. 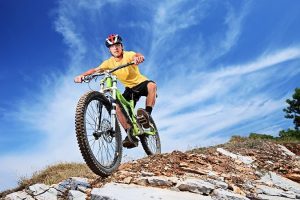 One of the leading class of bikes that have become very popular are mountain bikes, this is because they can handle a wide range of terrain. You can find mountain bikes in a wide range of pricing from inexpensive all the way up to handmade custom bikes. There are plenty of quality, cheap mountain bikes for the rider on a budget. For this article, we will be focusing on the more affordable mountain bikes. Our list of the bikes features a number of best mountain bikes under $500, $400, $300 and $200. We tried to make sure that we covered enough of the bikes that most people would be interested in reading about. 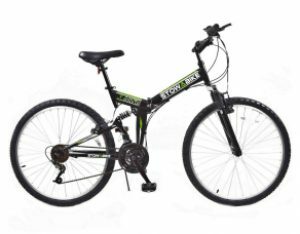 The FSX Mountain bike features a heavy duty suspension, lightweight and durable frame with a set of low profile handlebars that make it easier to navigate the off-road trails. The high-quality 24-speed drivetrain delivers unequaled performance and speed when you really need it. The heavy duty braking requirements of mountain trail riding are handled by a unique braking system front and rear. Gravity designed the FSX bike with a heavy duty, yet lightweight all aluminum frame that is still rugged enough to hold up to even roughest trails. It features a unique, adjustable dual suspension system which helps to smooth out the ride. The 24-speed gear train includes front and rear Shimano derailleurs and handlebar mounted gear shifter levers. The braking is handled by front and rear disk brakes which are far more precise than the traditional caliper style brakes found on other types of bikes. The FSX Mountain bike from Gravity is on the higher end of the best mountain bikes, but with all of its high-end features, it definitely represents a great value. The Thruster KZ2600 bike is made using only the highest quality materials in the frame, suspension, drivetrain and braking systems. The engineers at Kent paid close attention to the construction so that it was sturdy enough to handle everything that you will come up against while riding on your favorite trails. The Thruster KZ2600 is designed especially to handle the rugged terrain found on all-mountain trails. The sturdy, yet lightweight all-aluminum frame features a floating beam suspension system that is paired with an ultra strong set of suspension forks. To help absorb as much of the shock from the trail to help out with this they added a pair of double-walled alloy wheels and oversized tires. The speed is generated using the 21-speed gearing and Shimano Tourney Derailleur system with dual handlebar mounted Shimano Rapid Fire gear shifter levers. The bike braking system features a front wheel disk and rear pull caliper brakes. For Under $300, the Kent Thruster KZ2600 is great mountain bike that would be a perfect fit for anyone regardless of your riding skills. The unique design of the MTB bike which features a built-in folding mechanism that makes carrying it in the trunk of the car or tucks it neatly in the back of your SUV. The bike is made from the best quality materials throughout the whole bike. The suspension built into the frame and forks help to smooth out as much of the shock for the rugged terrain found on most of the mountain trails. The all steel frame with the Stowabike folding mechanism is designed to be ultra strong and durable in order to handle everything that you will come up against when trail riding. The dual top pull caliper style brakes feature a right and left handlebar-mounted brake levers. The 18-speed drivetrain features Shimano rear derailleur and Sunrun FD-QD-35 front derailleur with right and left-hand grip shifter. The Stowabike 18-speed Bike is one of the lowest cost bikes on our list and it makes this folding bike a perfect option. 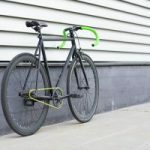 Schwinn is one of most widely recognized bike manufacturers in the world and the Protocol 1.0 is a great example as to why they sell a whole lot of bikes. It is designed especially for handling the rugged terrain of the mountain trails. The sturdy, dual suspension frame and forks were made to tame just about anything the trail can throw at it. The ultra-sturdy, all aluminum frame with built in suspension and the suspension forks combine to provide an unmatched level of comfort even on the roughest terrain. The 24-speed drivetrain featuring Shimano Altus rear derailleur and alloy crank with Shimano handlebar mounted EZ-Fire shifters are more than capable of providing all the speed you need. The stopping power is provided via front disk brakes and in the rear center pull caliper brakes give you the precise stopping that you need. 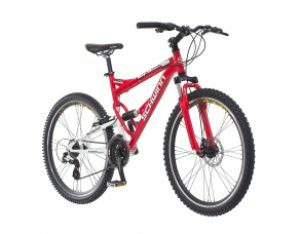 The Schwinn Protocol 1.0 Bike would be great for choice for anyone looking specifically for a mountain bike. It will handle anything the mountain trail can dish out. Mongoose has been building high-quality bikes since the 70’s and the Status 2.2 Women’s Bike is another great example of their design and craftsmanship. This bike is made from only the highest quality materials that provide strength, speed, comfort, and durability. The dual suspension configuration is a staple for mountain bikes due to the way it handles the roughest terrain. The Status 2.2 for women features an ultra strong, lightweight all-aluminum frame with the traditional dropped bar design that signifies a women’s bike. What makes a mountain bike most unique is the mono shock built into the frame. The other thing that sets this type of bike apart is the built in shocks in the forks. The combination of the two along with the wide wheels and knobby tires helps to absorb as much of the shock from the rugged terrain. The 21-speed drivetrain provides all of the speed needed to thanks to the Shimano rear derailleur, dual SRAM twist handlebar mounted shifters. The Mongoose Status 2.2 Women’s Bike is a high-quality bike that is designed for riders of all skill level and the price point makes it highly affordable. The Merax 26″ Bike is made from only the highest quality materials and workmanship. It is one the best-rated economy mountain bike that we have come across. While it is a single suspension model, it still able to handle most of the roughness associated with mountain trails. 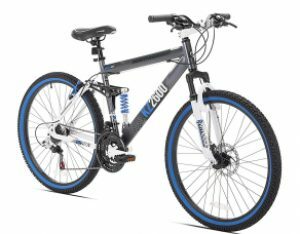 The Merax Hardtail Mountain Bike features a heavy duty all steel frame in order to hold up to the rugged terrain and the built in suspension in the forks gives the rider an additional level of comfort. The 21-speed drivetrain includes a high-quality front and rear derailleurs (QD-08A and HG-36A) and dual handlebar mounted shifter levers. The braking is handled by front and rear disk brakes that provide the most precision stopping power. The extra wide all aluminum wheels and knobby tires help to improve the ride even on the roughest roads. This Merax Bike is made from only the high-quality materials and craftsmanship which makes it a really good value. 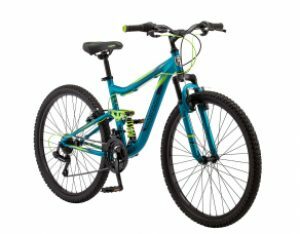 For under $200, It is perfect for an entry-level men’s mountain bike. The Sorrento Hardtail Bike is a high quality, economy level bike that features many components often found on higher end bikes. 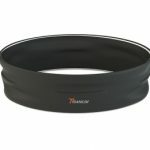 All of the components are made from the high-quality materials and workmanship that delivers high-quality performance. 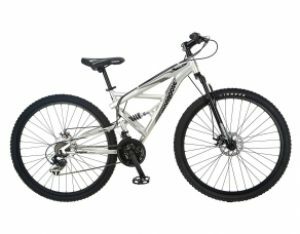 At the heart of the Sorrento Mountain Bike is a heavy duty all-aluminum frame that is both lightweight and extremely durable. When you combine the coil springs that are built into the forks and the oversized 27.5″ double wall alloy rims and knobby tires it delivers an unequaled smooth ride, even on the roughest trails. The 21-speed drivetrain includes Shimano front and rear derailleurs (Shimano Tourney and Shimano Altus, respectively) and handlebar mounted gear shifter levers. The front and rear braking system feature Tektro Alloy Linear caliper brakes and Shimano brake levers. 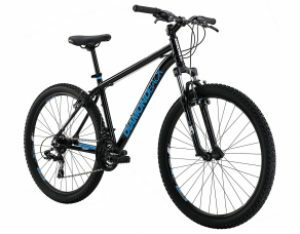 The Sorrento Hardtail Mountain Bike from Diamondback is one of the best values that we have come across and it represents a great quality bike at an economy price. 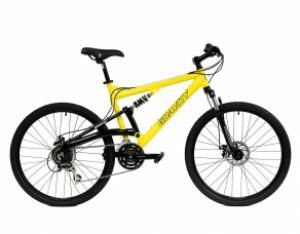 Mongoose is one of most well-known bike manufacturers and they offer a wide range of bikes and the Impasse is a high-quality mountain bike that fits in the economy class. Even at the lower end, it is still packed with many features that you would expect to find on a much more expensive bike. The Mongoose Impasse is a 29″ bike with a heavy duty dual suspension bike with an all-aluminum frame with a built in mono shock and suspension forks that help to smooth out even the roughest mountain trails. The 21-speed drivetrain includes Shimano front and rear derailleurs and handlebar mounted Shimano SRAM twist shifters which provide all of the speed you are needing to maneuver around your favorite mountain trails. The braking is handled by a precision set of disk brakes front and back. The all aluminum alloy wheels feature quick release hubs which make it easy to unload and load back up in the car after a long ride. 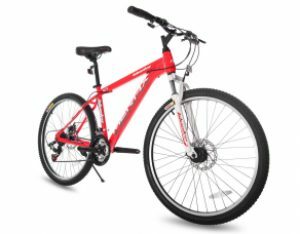 You cannot go wrong with the Mongoose Impasse Mountain Bike, it is an amazing value at under $300 and it will deliver many years of mountain trail riding.